Click on the Layout to edit. 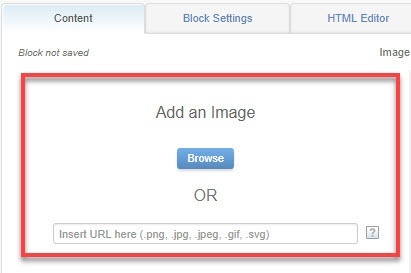 Select the Image content block and drag and drop into the content area where the image will be placed. 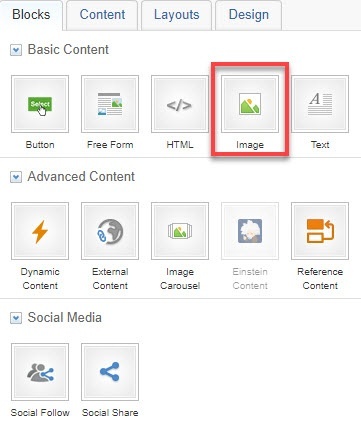 In the Content tab, click Browse to add a saved image, or enter the URL for a linked image. The maximum file size for images is 3 MB. Allowed file types are JPEG, PNG, SVG, GIF, and AMPscript. Under "Image Settings", add a border, padding, and alignment for the image as desired. Under the Block Settings tab, add a background, border, and spacing to your block. Under "Link", click Add if the image will have a link. This opens the Insert Link window.